The idea that we should limit the intake of all high-fat, high-calorie foods is now outdated and actually unhealthy. Research conclusively tells us that most plant-based fats and oils should be promoted and encouraged, because adding them into our diet results in significantly better heart and metabolic health. What’s more, this impressive health benefit is one that few other dietary changes can achieve. From the literature, I think we can confidently conclude that even eating more fruits and vegetables or more whole grains, whilst still important, is unlikely to give us the same heart health benefits that eating more plant-based fats and oils does. What are plant-based fats and oils? If not using avocado or nut spreads, to opt for margarine instead of animal-fat or lower-fat alternatives, such as butter, honey or jam. Will eating these foods make you put on weight? Research now clearly tells us that the fat and calorie content of a food does not, surprisingly, predict its effect on our weight. some high-fat, higher-calorie foods, such as nuts and cheese, are associated with less or no weight gain. some low-fat, lower-calorie foods, such as soft drinks and refined grains (like white bread and white rice), are associated with significant weight gain. Whilst there are a lot of factors at play here, fat is well-known to slow down digestion, and thus changes our hormonal response after eating. This is thought to contribute to a foods impact on our weight in the long-term, and might be partly why skim-milk or low-fat milk does not appear to be any better for our weight than full-cream milk. The healthiest way to manage your weight, I believe, is to mostly enjoy a wide variety of minimally processed plant foods, including the plant-based fats and oils listed above. If your daily consumption of calories is something that needs to be addressed, the first step is eating less highly processed or “treat” foods, such as cakes, biscuits, soft drink, refined grains and confectionary. 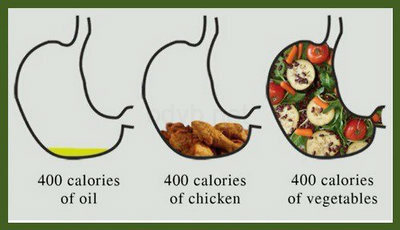 The total calories that you consume every day is still important. But the total calories (or total fat) found in a single food, is not. Myth 1. Eating breakfast boosts our metabolism. The best scientific evidence we have shows our resting metabolic rate is not increased by eating breakfast. Indeed, research shows that even not eating anything prior to midday for 6 weeks straight does not impair our resting metabolism. Myth 2. Eating breakfast means we eat less calories in total throughout the day. This is not only unproven, we actually know the exact opposite is true: we eat more. This makes good sense, because when we skip breakfast, we are skipping the intake of a significant amount of calories. Myth 3. Purposely skipping breakfast is a good strategy for weight loss. does not have any significant effect on our weight compared to eating breakfast. Just because eating breakfast does not increase our metabolism, and can mean we eat more calories in total, does not mean that we should purposely skip it. Myth 4. When we eat is more important than what we eat. Whilst breakfast eaters have higher nutrient intakes than breakfast skippers, high nutrient intake is (of course) dependant on eating more nutrient-rich foods. Whilst breakfast eaters have better long-term health than breakfast skippers, good health is (of course) dependant on eating healthier foods. Myth 5. There is a ‘correct’ time to eat for everybody. When we eat in reaction to our external environment and emotions, we are more likely to overeat. When we eat in response to our internal hunger signals, we are less likely to overeat. Being more conscious about eating according to hunger is one of the most effective strategies we have to prevent overeating. For me, the biggest problem with advice about eating or skipping breakfast is that it gives the impression we must be eating at a certain time. In general, we actually don’t. For most of us, eating is best done by listening to the hunger signals of our body, and not by worrying about what the time is on our clock.